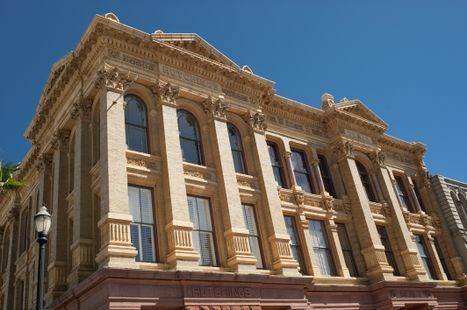 Two generations of stone masons have a personal tie to one of Galveston’s most photographed historic buildings – the Hutchings-Sealy Building, 2328 Strand. This week, fifth-generation stone mason Curtis Hunt IV will remove and patch deteriorated stones and stabilize cracks to this 1895 building designed by famed architect Nicholas J. Clayton. The Hutchings-Sealy Building is one of more than 20 buildings owned by George Mitchell and the Mitchell family. Mitchell bought the building in 1985 and Hunt’s father, Curtis Hunt III, worked with Ford, Powell & Carson Architects on the building’s restoration in the 1980s. The younger Hunt has worked as a stone mason for 14 years, first working with his father as part of Curtis Hunt Restorations for 13 years and now operating his own company, Traditional Masonry Restoration and Repair. Over the years, he has worked on restoration projects at the Alamo and various missions in San Antonio as well as historic courthouses across Texas, including Goliad, DeWitt, Nueces County and Bexar County. Hunt’s grandfather, Curtis Hunt II, also has ties to Galveston and worked as a bricklayer with his extended family members early in his career on the Island. According to “Galveston’s Architecture Guidebook,” the Hutchings-Sealy Building was built by John H. Hutchings and George Sealy for their Ball, Hutchings & Co. which was later reorganized as Hutchings, Sealy & Co. The building actually consists of two adjoining structures made to look like one. 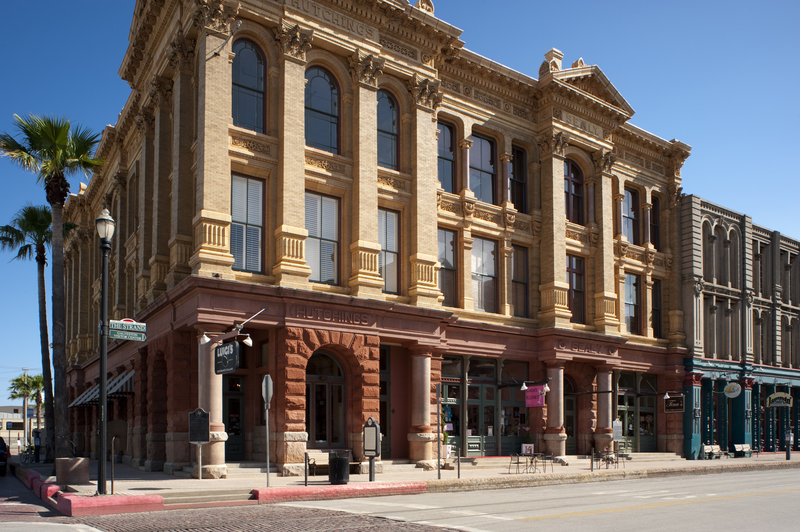 The corner building with “Hutchings” housed a bank while the adjoining “Sealy” building was built to house the Sealy offices. The buildings’ terra-cotta-encased steel frame was one of the earliest examples of steel framed construction in Texas. 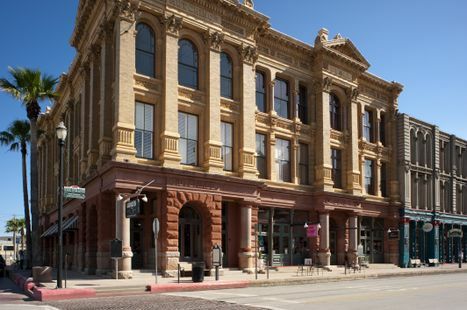 The Hutchings-Sealy Building is now home to Luigi’s Ristorante Italiano, Karen’s Kloset and Tina’s Gifts & Clothing, as well as offices on the upper floors. The building features a wrought iron and marble antique staircase from the ground floor to the third floor as well as a glass enclosed elevator with views of the common area atrium. The second floor of the building includes a glass block floor extending from the front to the rear of the common area. Mitchell Historic Properties oversees properties owned by George Mitchell and the Mitchell family. During the past 30 years, the Mitchells have invested more than $175 million in rehabilitating historic properties in The Strand National Historic Landmark District. For commercial and residential leasing information, visit www.mitchellhistoricproperties.com or call (409) 763-5806.